Sail in Twenty-Twenty for the Adventure of a Lifetime! The Victoria to Maui International Yacht Race, first contested in 1965 and sailed every second year since 1968, is the pinnacle of Pacific Northwest ocean racing. Co-hosts the Royal Vancouver Yacht Club and the Lahaina Yacht Club have been preparing for your participation since July 2018. Come and enjoy a fun filled week of pre-race activities in Victoria, the Capital City of British Columbia and one of the most beautiful harbours in the world. From Victoria, we give you a unique ocean voyage over a course that is 2308 nautical miles on the rhumb-line. 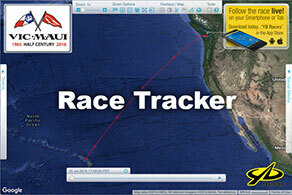 Vic-Maui challenges sailors to demonstrate their ocean sailing and weather routing skills. Success depends on sailing an optimal track relative to the North Pacific High pressure area and the Northeast Trade Winds. In Lahaina you will enjoy Hawaiian hospitality including a welcome party and the awards banquet, as well as a well-deserved sojourn in a tropical paradise. Join the Vic-Maui fleet to Sail in Twenty-Twenty for the Adventure of a Lifetime!